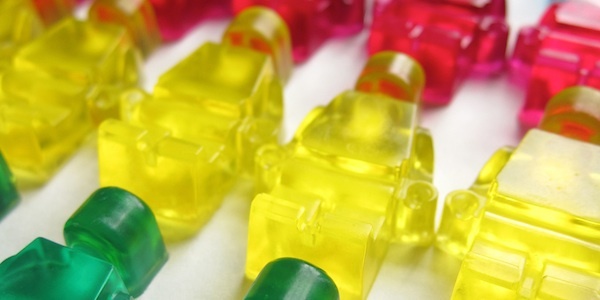 Jenny over at A Mom and 2 Things and I both live in homes where legos are loved by kids and husbands alike, so we thought it would be fun to make Lego shaped soap using our Lego ice cube trays. We were so thrilled with how they turned out. Using glycerine soap base that is available at the craft store makes this project really pretty simple. It’s not like you are making homemade soap from scratch. You are just coloring, scenting and shaping the soap. 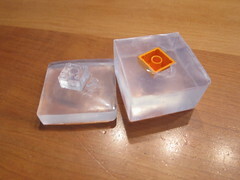 Silicone ice cube trays made perfect molds because the soap just pops out of them and they come in lots of fun shapes. They look awfully cute all packaged up. 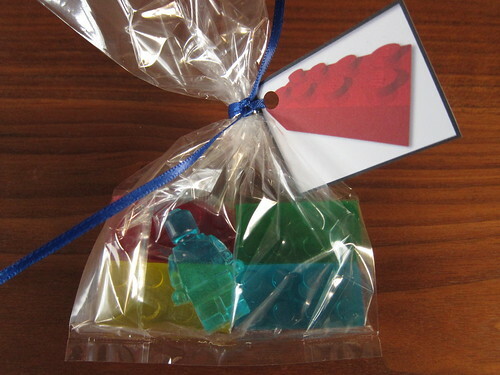 I even made little lego gift tags. 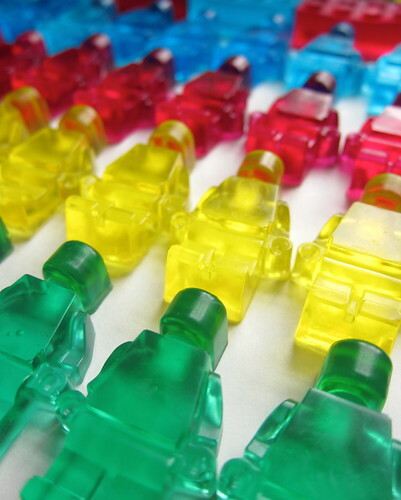 Silicone Lego ice cube trays – The Lego Minifigure Ice Cube Tray is available online and at Lego stores. 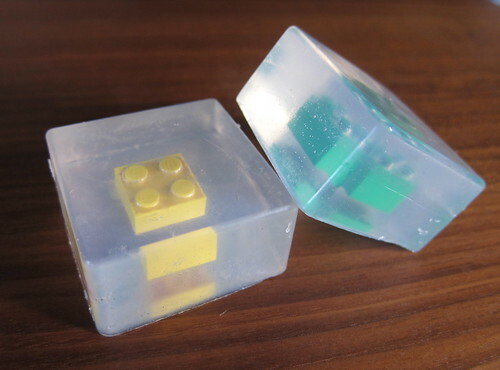 The Lego Ice Bricks Tray appears to only be available online currently. Make sure your ice cube tray is clean and dry. 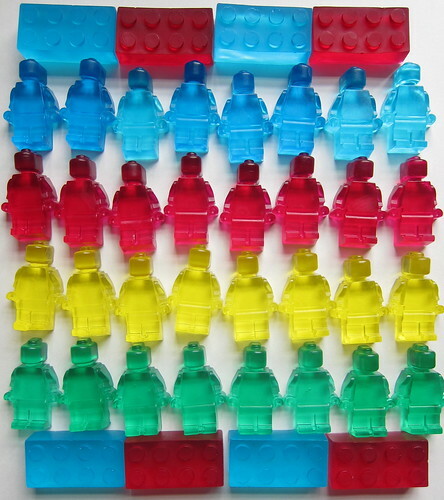 Cut the soap base into chunks, a little less than one cup chopped will fill one mini-fig ice cube tray, just over one cup for the Lego block tray. 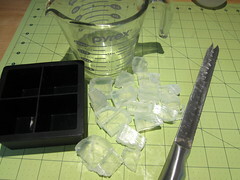 Try to cut the glycerin base into chunks about 1/2″, so it melts quicker. Put the chunks into the measuring cup. Microwave on high for 40 seconds, stir. If the soap base has not completely melted microwave in 10 second segments until done. Don’t be tempted to just do it for longer it will boil up and you will have a lot more bubbles to get out of the soap. Stir in the color. For the blue we used 6 drops, red took 12 drops, yellow took 3 drops, green took 3 drops yellow and 6 drops blue. Stir in a few drops of fragrance if you choose, careful not to overdo it! 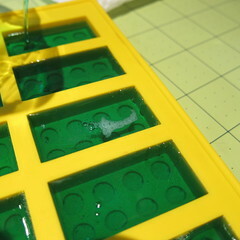 Carefully pour the soap base into the ice tray. You want to move quickly, so the base is still nice and liquid, but you want to try to fill the molds as close to the top as possible. Mist the top of the soaps with the alcohol, this will help get rid of any bubbles. We found it’s good to mist and wait a few seconds and then mist again if needed. Bubbles on soap before spraying…no bubbles after spraying. Let the soap sit until completely cool, (1/2 to 1 hour). We wanted to make numerous batches so we sped up the cooling process by moving the trays into the fridge after they were firm. Gently press the soaps from the molds. The silicone makes this easy as it easily pulls away from the soap. Glycerine soap will sweat, so store it in an airtight container or wrapped in plastic wrap. Melt the glycerine, you’ll need about 1 cup chopped. Stir in the fragrance if you choose. Pour a small amount of the base into the mold. Mist with alcohol to remove any bubbles. Let harden until firm, but still pliable. Press the Lego bump side down gently into the soap. Let the bar harden. Spray with alcohol to adhere things together. 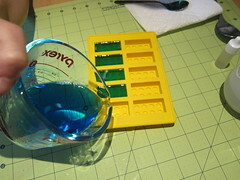 Without the alcohol the soap layers easily come apart.Melt another cup or so of the glycerine. 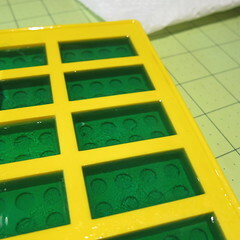 Pour into the mold until the Lego is covered with as much soap as you would like. Mist with alcohol to remove any bubbles. Let cool completely and unmold. We tried putting mini-fig soaps in a bar like this, but it really lost all definition. With all the different shapes of silicone molds available this project isn’t limited to just Lego shapes. We bought some chocolate molds in the shape of snowflakes and made these light blue and clear soaps. We even added some soap glitter to them. A set of these with a pretty towel or dish would make a great hostess, teacher or secret-santa gift. How cute. It looks so perfect all packaged up! That is so cool! l love that! It’s been a few years since I’ve made soaps. This has me itching to put together some soaps again. This may be a stupid question, since we wash ALL of our dishes with soap, but are the molds OK to use for regular drink ice after a project like this? Sara – I don’t see any reason why they wouldn’t still be ok to use for ice. I would just make sure to give them a good wash and rinse. Hi, just have a question. Where do you buy the colour dye from and can you use food colouring dye that you use for cakes? Thanks. We bought the dye at Michael’s with the rest of the soap making supplies. 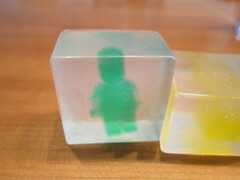 I have read that you can use food coloring in this type of melt and pour soap making and it will not color your skin.